Some of our products are seasonal this is why the stock is varying all the time. There are 2 main categories of products: spring-flowering and summer-floweing bulbs. 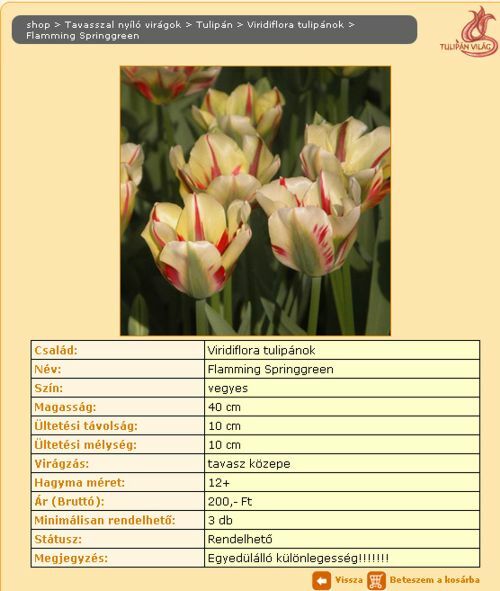 Within these categories you will find several items: for instance spring-flowering bulbs like tulip, daffodile, hyacinth, crocus and so on. This can be seen right on the home page. You can click on each flower item from one category. 2. Select a flower item from one category (ex. 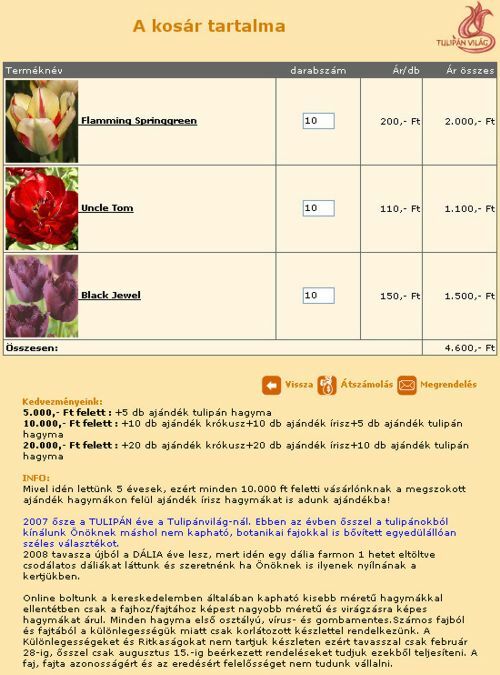 : tulip) and by clicking on it, you can read the brief description of the species’ type, blooming interval, planting depth and distance, sale prices and availabilities. You can always go back to the previous page by clicking on „Back” button and always find the main categories on the left side of the screen. 3. Select the flower item you would like to buy and place the item into your shopping cart by clicking "Order". We mention the requested minimum order at every item, so if you want more than the minimum, you can change the quantity here. Click "Submit Order" from the shopping cart to complete the order process. You can verify your shopping cart item by item before you submit the order. If you would like to cancel an item, then simply write „0” in the quantity field. If you would like to order more than the available stock quantity, the system will warn you and won’t let you go on. In every item description you will see the current stock (Status field), so you can avoid putting down the wrong quantity order. 4. 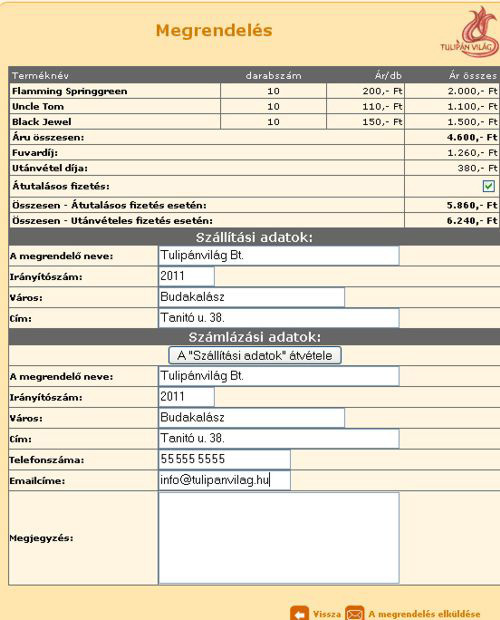 Click „Order” and fill out exactly the order sheet with your personal information: first choose country for the correct shipping fee, name, shipping address, phone number (mobile phone number if possible) and e-mail address. On the „Remark” field you can write more observations regarding the handling or shipping address. You can also mention your payment method: cash or bank transfer. (Details of payment are mentioned under the purchasing conditions menu). We receive your order as soon as you accept the purchasing conditions and click on "Submit Order", then we send you a confirmation upon completion to your e-mail address. 5. Our flower bulb webstore sells LARGE SIZED BULBS and MATURE ONES FOR BLOOMING, unlike the pre-packed small sized bulbs sold in the commerce. THANK YOU FOR CHOOSING US AND HAVE A GOOD PLANTING TIME!